One of the most bewildering devices out there is definitely a sewing machine. Why exactly? Because there are just too many buttons, small parts, and knobs to push or pull. As a result, people often fail to differentiate the function of one button from another. 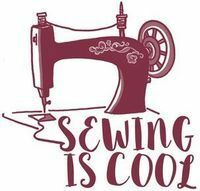 From our experience, we know that not understanding a sewing machine in its entirety can cause issues later on. A bobbin is one of those things that many people overlook or simply fail to understand. It’s one of the smaller parts of a sewing machine. That might be the reason why they consider it irrelevant. On the contrary, it’s one of the most important parts, and we’ll specify why. 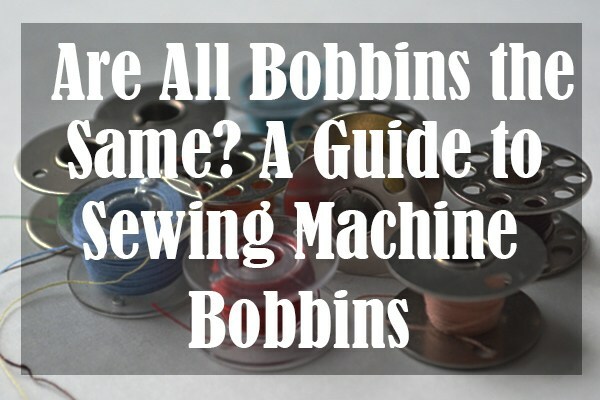 In order to ameliorate our readers’ lack of knowledge regarding bobbins, we’ve written this extensive guide. We’ll try to cover as much as we can starting from what they actually are, and then moving on to their types, use, etc. That being said, let’s get into it. What Does the Bobbin Do on a Sewing Machine? Do Sewing Machines Come with Bobbins? Where on a Sewing Machine Does the Bobbin Case Go? Are Sewing Machine Bobbins Universal or Interchangeable? How Much Thread Does a Sewing Machine Bobbin Hold? How Does a Sewing Machine Pick up the Bobbin Thread? So what in the world is a bobbin? Well, the bobbin is a small wood, plastic, or metal wheel that usually has a reel design. Its main purpose is to hold the thread. There’s a designated space on the cylinder where the thread wraps around. Furthermore, there are many bobbin winder mechanisms that wind the thread there. However, most people like to do it manually. That means taking out the bobbin, winding the thread, and putting the bobbin back. Therefore, bobbins are detachable parts. 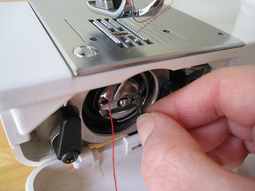 The sewing machine operates by catching the bottom thread from the bobbin (and the top thread from the needle). Therefore, a bobbin is a crucial part because the entire process of creating a stitch depends on it. Even though it looks like the most insignificant part of the entire machine, we assure you that’s not the case. A bobbin is definitely a multipurpose piece of equipment, and here’s exactly what it can do. As mentioned in the previous section, the main purpose of a bobbin is to hold a thread or a yard. It doesn’t necessarily have to hold these two materials. People can use any thin material which is suitable for weaving. Provided that it has the necessary weaving material, a bobbin pushes the thread up through the plate and connects it with the top thread. However, a bobbin can’t do that on its own. It has to operate alongside another part of the machine — the spool holder. The spool holder usually holds the thread from the side or the top and a bobbin secures it underneath. That way, it creates an anchor for the thread, as the sewing machine makes stitches. We already know that there’s a variety of bobbins out there to choose from. One of the leading factors that can help us tell them apart is the substantial difference in their size. The size of a bobbin may vary, and there could be a number of things that determine it. For example, the dimensions of a bobbin case can determine the diameter of the bobbin. If it’s too large, the bobbin can’t fit into the case. On the other hand, if it’s too small, it’ll just slide around inside the casing and sewing will be impossible. In most cases, the size of a bobbin matches the exact type and style of a specific sewing machine (the one it was meant for). Therefore, it’s important to know the class of the sewing machine before deciding to purchase a bobbin. Now, let’s talk about their actual sizes and how to differentiate them. For some people, being able to tell the bobbins apart based on their size is extremely difficult. Others, however, do it with ease. We agree that it can be a troublesome experience in some cases. Therefore, we want to help out and share a couple of tips and tricks that we’ve gathered over the years. The easiest way to check the size of a bobbin is to take a look at its thickness. Some FW bobbins are quite easy to spot, as they are thinner than the other bobbins. Alternatively, people who know the type and the class of their machine can try out each bobbin. If their machine uses L class bobbins and there are some bobbins that fit, then those are ¾ inch ones. The key here is to find a way to mark the bobbins and store them for easier later use. Color grading is one of the options that was extremely helpful to us. That means that each bobbin size and type should have its own container (preferably in different colors). Another method of marking the bobbins is to simply use nail polish and put a small dot on each one. Different colors can be used here as well. There are several different sizes of sewing machine bobbins. Although there might be other subtypes and variations of these sizes, we’ll mention the ones most commonly used. First of all, we have the style L bobbin. These bobbins are 0.350 inches high and 0.910 inches in diameter. 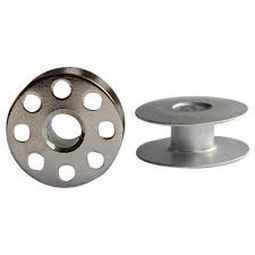 Second of all, there are style M bobbins, which people generally use on large and medium-sized sewing machines. They use them mostly to sew upholstery, heavy fabric, canvas, and leather. That’s why the dimensions are slightly bigger. They are 0.430 inches high and about 1.000 inches in diameter. Third of all, there are 66 Class bobbins, which have the same diameter as the Style L ones. However, their height is 0.310 inches. Finally, we have class 15 (A style) which are 0.460 inches high and 0.780 inches in diameter. That makes them the largest of the three, but their dimensions can vary depending on the sewing machine. Since we talked about the dimensions of these bobbin styles, we think it’s time to move on to their particulars. Let’s explore that in the following section. We’ve already established the fact that bobbins are sold in different classes and styles to fit specific sewing machines. These styles vary in height, shape, and diameter. In addition, some of these classes can be universal, while others only work with certain machine brands. There are 4 common types of bobbins, and they are as follows. We already know their dimensions, so we’ll skip that info. First of all, we have a 15 Class bobbin. This style is quite common, and its design is pretty straightforward and simplistic. Both top and the bottom of this bobbin are completely flat, and these parts can be either plastic or metal. Second of all, there’s an L Class style which is almost completely universal. It has a flat design as well, which allows it to fit into both loading types. Third of all, we have an M Class style. This one is interesting because people often use it with industrial sewing machines. The reason why it’s not so popular with traditional machines is its size. However, the size of its diameter allows this bobbin to hold more thread than its counterparts. The last bobbin type is the 66 Class. Its design is oddly specific, which means that only those people who have a Singer machine can use it. It’s compatible with top-loaded models only due to its round design. Visually, all bobbins look almost the same. However, when it comes to their structure and the material that they’re made of, there are some differences. People can either use metal or plastic bobbins but their usage is tied to the sewing machine model. For example, older vintage models aren’t that much compatible with plastic bobbins. How so? Well, they start out just fine but become loose over time. As a result, there’s a lot of jerking motion which causes imperfections in the stitches. Stitches could either get pulled up or have a visible difference in tension. Even if plastic bobbins are compatible with older models, the performance isn’t optimal, and there’s a chance for an issue to occur. On the other hand, modern machines work extremely well with plastic bobbins due to their design. The manufacturers of these modern models always try to make their products as diverse and compatible as possible. However, it’s a good idea to have some extra thread on plastic bobbins in order to make them heavier. That reduces the chances of them jerking around. 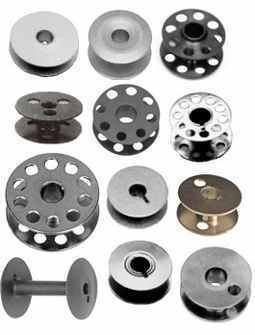 When it comes to the metal bobbins, they are generally more durable and sturdier. However, they are no stranger to the same problems (that the plastic ones are facing). They’re liable to movement when they’re completely empty. But still, they are definitely a better alternative for old vintage machines since they’re considerably heavier. Most sewing machine manufacturers sell various accessories for their models. Some of these accessories end up being an integral part of the whole package, while others don’t. Unfortunately, bobbins belong to the latter group. There’s a reason why people have to purchase bobbins separately, and it’s because these manufacturers advertise them as separate products. However, certain sewing machine brands might include a couple of bobbins as a part of a promotional package. But honestly, we haven’t seen many of those lately. Bobbin cases are usually removable parts that have to be taken out to be able to replace the bobbin itself. There are several factors that can affect the position of a bobbin case. Such factors include the sewing machine model and the size of the bobbin. Bobbin cases can either be ‘front loading’ or ‘side loading’ cases. Front loading bobbin cases are the most common type, and the opening for them is located on the side of the sewing machine. That’s the side that always faces the user. Additionally, side loading bobbin cases operate in a similar way. The only difference is that sideloading bobbins feature a smaller hole at the machine’s top. That’s the hole where the needle of the machine will dip down. It’s important to remember that these side loading bobbins aren’t compatible with front loading ones. However, front loading bobbin cases work well with side loading machines. It’s a bit unusual, but that’s how it is. There’s a common misconception that most bobbins are interchangeable or universal. It would be an excellent advantage if one could simply change the bobbin with any other. Unfortunately, that’s not possible because each machine bobbin area has to match with its bobbin. We know that even the slightest difference can cause problems in the long run. How so? For example, if there’s a machine that uses plastic bobbins, the tension value will differ from the ones that use metal bobbins. If users decide to switch between the two, the tension will lose its balance and mess up the stitching. Additionally, if a bobbin is too tall, it can alter the stitch formation negatively. That’s especially true for machines that have drop-in bobbins. Our advice is to always use bobbins which the manufacturers of the sewing machine mention. That way, the users can make sure that nothing disrupts the performance of their sewing machines. Replacing sewing machine bobbins may vary from one machine to another. However, the basic principle should be the same for all models. Therefore, we’ll list the steps that will show the users how to do it properly. The first thing to do is to remove the bobbin cover by pressing the button to the right of it. When the cover pops up, the users will have enough space to remove the old bobbin and insert the new one. When inserting the bobbin, the users need to make sure that it rotates counterclockwise when they pull the thread. The thread should go through the first designated slot and then wind back to the left. The users should hold the top of the bobbin gently and then pull the thread through the second slot. The last thing to do is to pull the thread towards the back of the machine. It’s quite simple. Filling a bobbin is pretty straightforward and simple, provided that you follow certain instructions. The golden rule is to wind the bobbin before threading the needle and the machine. Here’s how we do it. First, we’ll place the spool of thread on the spool pin and slide its cap over the rim of the spool. That prevents the thread from tangling, and it’s important that the users do that. Next, we’ll push the bobbin winder pin to its far left and make sure that it’s firm. Now we can pass the thread from the spool through the machine’s thread guide. Afterward, we can place the bobbin onto the pin and push the winder pin to the right. Now, it’s crucial to hold the thread end and gently step on the speed controller. After the desired amount of thread is wound, we just need to push the bobbin to the left and remove it. That’s pretty much it. The question of how many yards of a thread a bobbin can hold is quite common among the members of the sewing community. The amount of yards corresponds to certain factors, such as tension settings, thread size, and speed. Professional pre-wound bobbins often have more thread on them than the regular ones. The reason for that is that professionals always aim for precision. As for the home variants, the normal thread amount is somewhere between 35 and 60 yards. There’s a possibility that a bobbin could hold more than that. However, we think that anything above 60 yards is simply unnecessary. In order to form a seam, the needle has to shove the thread constantly up and down. Many people often wonder what’s going on inside the machine when the needle moves. The whole process looks like there’s some sort of sorcery involved. However, it’s actually a simple mechanism that’s doing the job. There’s a small hook beneath the needle that rotates and captures the thread from above. Then, it loops it around another thread and then reels it back. When connected, these two threads form a loop and that’s how a stitch is formed. The thread is wound from a set of gears and pulleys that are all connected. A bobbin is one of those gears. When it comes to adjusting the bobbin tension, the users can use a slotted screwdriver to turn the slotted screw. We need to keep in mind that certain inconveniences might arise during that procedure. For example, the bobbin thread might appear slightly on the right side of the fabric or it might loop. To fix the first issue, the users need to turn the screw clockwise in order to increase the tension. The angle of turning should be around 30 to 45 degrees. To fix the second issue, the users have to turn the screw counterclockwise to loosen the tension. The angle should be roughly the same (around 45 degrees). 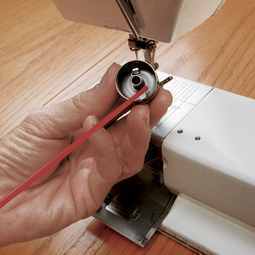 A loose bobbin thread is a common occurrence when it comes to sewing. There are several reasons why it happens. The main reason might be that the machine hasn’t been threaded properly. If that’s the case, the user needs to return the upper thread tension dial and rethread everything. Another cause might be that the thread and the needle aren’t appropriate for the fabric in use. To address that, the user should check whether the bobbin’s installation is correct. Additionally, the bobbin needs to be compatible with the machine, so it’s a good idea to check that as well. People who are dealing with this problem should hold the thread in the needle to the left. At the same time, they need to put the needle down in order to pick up the bobbin thread. It might be hard to see whether the bobbin thread came up or not. If that happens, the users just need to take a darning needle and make sure to run it under the pressure foot. The bobbin thread should be there, and they’ll need to straighten it out. Now, everything should work as it should. If a bobbin isn’t spinning, there could be several reasons for that. Something might be jamming the bobbin, or its gears might be worn out. Whatever the case might be, it’s best to take the sewing machine to a repair shop. People were probably looking for a DIY solution for this issue, but we strongly advise against doing that. Doing so might only further damage the machine, and that will only cause the repair shop to charge more. The only thing that people can try is to look for any traces of lint and possibly cleaning them. Lint is often the culprit in situations like these, so it’s a good idea to check that. We’ve read numerous reports where various users said that the needle was the one causing the thread to break. That might be true. However, we think that the bobbin tension is too tight and that’s why the thread breaks. In order to prevent the thread from breaking, the users need to loosen up the tension. We’ve already explained how to do that, so we’ll skip that part here. If a thread gets stuck in the bobbin area, the first thing to do is to open the bobbin casing. After that, the users should always try to rethread it since that solves 90% of the problems right away. To do that, they need to take the bobbin out and inspect it. If there are any sorts of loops or knots, they just need to pull the thread out and wind it until everything’s smooth. If the problem still persists after rethreading, they might have a faulty machine. In that case, it’s a good idea to bring the machine to the repair shop. When a bobbin case falls out, there should be three loose parts that need to be put back in a correct order. The most important piece is the one that looks like a crescent moon. To place it back, the users need to turn the knob on the right-hand side. The piece inside the bobbin case needs to fit with the ‘crescent moon’ one. Once that’s done, the next piece to put back is the one that looks like a big circle (the biggest of the three). When it's back into its position, the users need to lock it by pulling the two plastic arms towards the center. Finally, the last piece to put back is the bobbin itself, and we already know how to do that. This might sound a bit repetitive but the easiest fix for a thread bunching up is to simply rethread it. Like we’ve said before, 90% of the problems are solved by rethreading, and it should always be the first thing to do. The thread is probably bunching up because it’s not moving through the tension discs properly. Therefore, the tension is the culprit, and it can be fixed by rethreading. Most people make an amateur mistake where they don’t hold the end of the thread when they start sewing a seam. What happens is that the top thread gets drawn down into the bobbin area and causes a mess. To avoid bobbin jamming, our advice is to simply hold the thread loosely for the first couple of stitches. Another cause why a bobbin keeps jamming might be a machine that has bad threading. Rethreading is still a completely valid option and a potential solution, so the users should try it out. In addition to bad threading and the position of the presser foot being up, another possible cause of loops is the needle itself. The needle might be slightly curved, or it might not be the right one for the fabric in use. Changing the needle is probably going to resolve the problem. Knotting is basically the same as bunching. Therefore, the same solutions apply. If the bobbin keeps knotting, the users can either rethread the bobbin or correct the tension. The tension on top of the fabric is caused by knotting that occurs on the bobbin. If it’s on the bottom, it’s probably the result of the top thread. We’d like to wrap up this quite lengthy guide by saying that we’re no real experts just yet. We’re still learning ourselves, but we’ve gathered the necessary experience over the years. These are just various tips and trick that have helped us during that time. Therefore, we decided to share them with others. So we really hope that our readers were able to learn something about bobbins from us. Was this article helpful to you? If it was, it would mean a lot if you could share the post with others. Also, we’re always interested in hearing what you have to say. That’s why we encourage you to leave your comments below.